Knife blocks and cutting boards made from wood are manufactured to meet the highest demands with regards to quality and design. These timeless products are skillfully manufactured to the highest level. Great demands are made not only on design and function but also on the quality of the original wood. Of equal importance to beauty and variety of the different sorts of wood are sustainability and ecological responsibility. The durability of the products corresponds with the life cycle of the wood that has been employed. This means that the raw material for the respective products can grow again during the time they are being used. 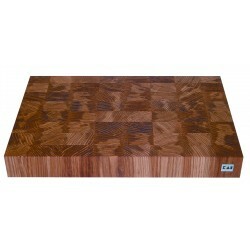 SpecificationsBrand: KaiType: cutting boardMaterial: oak woodLength: 39 cmWidth: 26 cmHeight: 3.6 cm.. CUTTING BOARD, WALNUT, WITH NON-SLIP RUBBER FEET, 50/ 30-40/ 5 cm L/W/HSpecificationsBrand: KaiType:..
SpecificationsBrand: KaiType: cutting boardMaterial: Oak /Walnut/Maple/Cherry woodLength: 47 cmWidth..
SpecificationsBrand: KaiType: cutting board END GRAINMaterial: Oak woodLength: 39 cmWidth: 26.2 cmHe..
WOOD CHOPPING BLOCK, OAK 38,9/ 38,9/ 3,0 CM L/W/HSpecificationsBrand: KaiType: cutting board END GRA..